Our mission to Shenzhen, China was two fold. 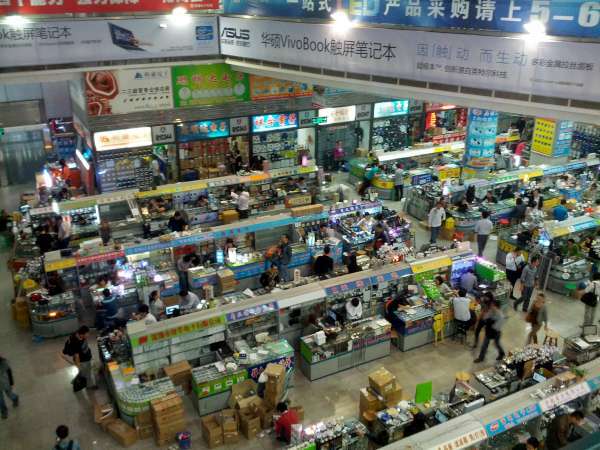 We wanted to walk and map the huge Huaqiangbei electronics wholesale market. 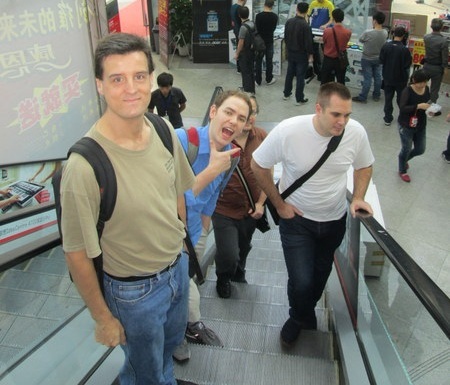 For a more in-depth review of the market check out our previous Global Geek Tour of Shenzhen, China. All our projects are built with parts from this market, understanding it better helps us reduce cost and increase the speed of production. Our second objective was to ship a small (100kg) palette of tools and components back to our workshop. The market divides nicely into quadrants by two major streets. For five days we walked the market. Building by building, floor by floor. We noted the major buildings related to components. There’s a ton of retail electronics, cell phones and accessories not related to components, we avoided these to concentrate on the things we found most interesting. We also visited the market with two pros. First a visit with Mitch from Hackvana. He introduced us to his favorite suppliers, and showed us around a tool building we missed last time. Picture courtesy .:Oomlout:. 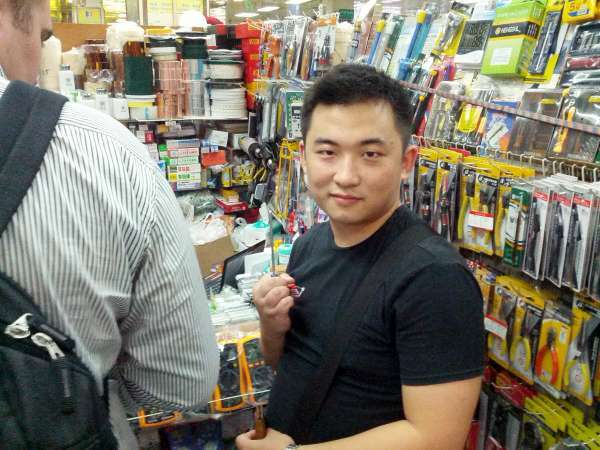 On Thursday we went hunting in the market with Eric Pan, founder of Seeed Studio. He showed us how he sorts the good stuff from the crap. 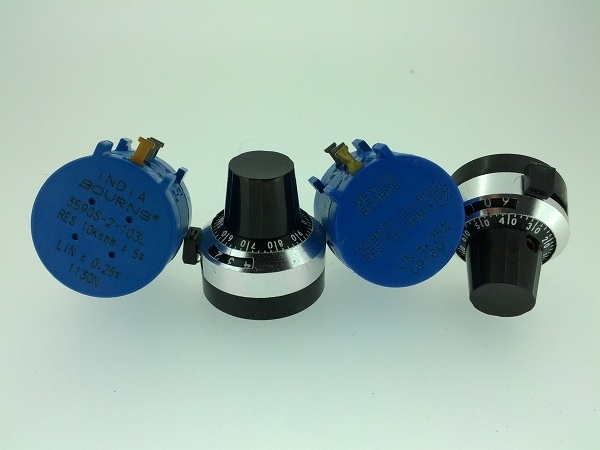 Among our cool finds were multiturn potentiometer knobs. Two potentiometers were available. The genuine Bourns was made in India and is very easy to turn ($1.30). A clone stamped “MexLco” was half the price and had a much stiffer mechanism. 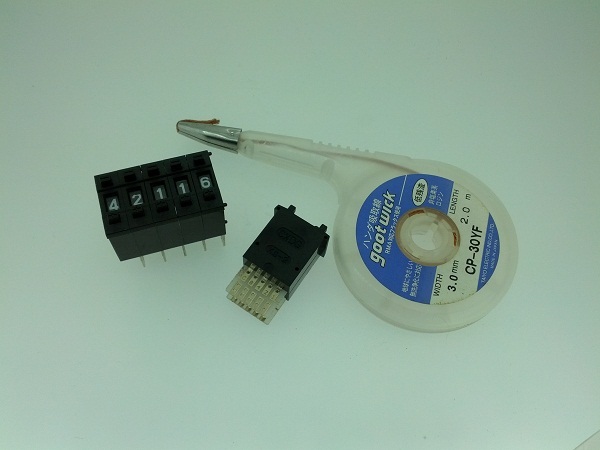 We also picked up a “goot” brand solder wick with a handy dispenser. Several people said any Goot brand products in China are likely counterfeit. We also liked this analog 0-9 counter with binary-coded decimal output. Our intention is to start an open source map of the Huaqiangbei wholesale that anyone can update. It will also published as a Google Map layer so anyone visiting Huaqiangbei can navigate from a smartphone. Seeed Studio, Hackvana, and a few market regulars are also interested in sharing their knowledge through an open medium. Immediately we realized that sourcing tools and components in the market is complicated. Not just the language barrier, that can be solved with a calculator, but the overwhelming nature of the beast. Since the Huaqiangbei is a sellers market, large quantities and long standing relationships rule. It is very difficult to haggle a price low enough to challenge Aliexpress and Taobao, which often include free shipping. We decided to get our tools online instead, and avoid the hassle of haggling and shipping to our workshop. Earlier this year we went to the market accompanied with Seeed’s sourcer and got an offer for custom push buttons: 30 pieces minimum at around $2/piece. This time we visited the same stand with Mitch from Hackvana and the order now required 500 pieces minimum. Going back with Eric (Seeed’s founder) a few days later and the minimum was quickly negotiated to 1 piece. Long standing relationship and promise of volume sales rule. The market remains the perfect place to look, hold, touch, feel, and understand the parts available in mass volumes. It’s also an awesome place to be inspired for new projects, as you’ll never see more diverse electronics in one place anywhere in the world. While the markets of Huaqiangbei continue to grow, like all brick and mortar stores they exhibit decline. Like us, many market users we talked to browse at the market but then turn to online sources. The stock in the stands is stagnant, and most buyers would never trust the quality of advanced components like chips sourced from the market. Today we’ll post our interview with Mitch from Hackvana. He’s been working in the markets for a year and half to help hackers get in touch with the torrent of components available in Shenzhen. Next Tuesday we’ll follow up with an interview with Dimitri from the recently controversial Smartduino project, a market veteran with 7 years experience running market stalls and exporting components. This entry was posted on Thursday, December 6th, 2012 at 3:30 pm	and is filed under Editorial, Global Geek. You can follow any responses to this entry through the RSS 2.0 feed. You can skip to the end and leave a response. Pinging is currently not allowed.